Spanish language distribution in the United States by county as of 2000. The Spanish language has been present in what is now the United States since the 15th century, with the arrival of Spanish colonization in North America. Colonizers settled in areas that would later become the states of Florida, Texas, Colorado, New Mexico, Arizona, Nevada, and California, as well as the Commonwealth of Puerto Rico. The Spanish explorers explored areas of 42 future U.S. states leaving behind a varying range of Hispanic legacy in the North American continent. Western regions of the Louisiana Territory were also under Spanish rule between 1763 and 1800, after the French and Indian War, further extending the Spanish influence throughout the modern-day United States of America. After the incorporation of these areas into the United States in the first half of the 19th century, the Spanish language was later reinforced in the country by the acquisition of Puerto Rico in 1898. Later waves of emigration from Mexico, Cuba, Venezuela, El Salvador, Argentina, and elsewhere in Hispanic America to the United States beginning in the second half of the 19th century to the present-day have strengthened the role of the Spanish language in the country. Today, Hispanics are one of the fastest growing ethnic groups in the United States, thus increasing the use and importance of American Spanish in the United States. Juan Ponce de León ( Santervás de Campos, Valladolid, Spain). He was one of the first Europeans to arrive to the current United States because he led the first European expedition to Florida, which he named. Spanish was the first European language spoken in the territory that is now the United States. Spanish was among the very first European languages spoken in North America, preceded only by Old Norse. Spanish arrived in the territory of the modern United States in 1493, with Columbus' arrival to Puerto Rico. 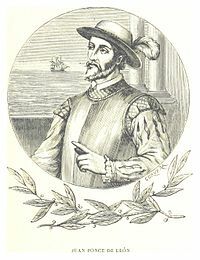 Ponce de León explored what is now Florida in 1513. In 1565, the Spaniards founded St. Augustine, Florida, and as of the early 1800s, it became the oldest continuously occupied European settlement in what is now the United States. In 1898, San Juan, the capital of Puerto Rico, became the oldest city in all of the U.S. territory: Juan Ponce De León founded San Juan in 1508. Historically, the Spanish-speaking population increased because of territorial annexation of lands claimed earlier by the Spanish Empire and by wars with Mexico and by land purchases, while modern factors continue increasing the size of this population. In 1819 Florida was transferred by Spain to the United States via the Adams–Onís Treaty; many Spanish settlers, whose ancestors came from Cuba, Andalusia, and the Canary Islands, became U.S. citizens and continued to speak Spanish. Spanish language heritage in Florida dates back to 1565, with the founding of Saint Augustine, Florida. 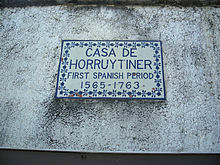 Spanish was the first European language spoken in Florida. After the Mexican War of Independence from Spain, California, Nevada, Arizona, Utah, western Colorado and southwestern Wyoming also became part of the Mexican territory of Alta California. Most of New Mexico, western Texas, southern Colorado, southwestern Kansas, and the Oklahoma panhandle were part of the territory of Santa Fe de Nuevo México. The geographical isolation and unique political history of this territory led to New Mexican Spanish differing notably from both Spanish spoken in other parts of the United States of America and Spanish spoken in the present-day United Mexican States. The relatively recent but large influx of Spanish-speakers to the United States has increased the overall total of Spanish-speakers in the country. They form majorities and large minorities in many political districts, especially in California, Arizona, New Mexico, and Texas, the American states bordering Mexico, and also in South Florida. Mexicans first moved to the United States as refugees in the turmoil of the Mexican Revolution from 1910–1917, but many more emigrated later for economic reasons. The large majority of Mexicans are in the former Mexican-controlled areas in the Southwest. At over 5 million, Puerto Ricans are easily the second largest Hispanic group. Of all major Hispanic groups, Puerto Ricans are the least likely to be proficient in Spanish, but millions of Puerto Rican Americans living in the U.S. mainland nonetheless are fluent in Spanish. Puerto Ricans are natural-born U.S. citizens, and many Puerto Ricans have migrated to New York City, Orlando, Philadelphia, and other areas of the Eastern United States, increasing the Spanish-speaking populations and in some areas being the majority of the Hispanophone population, especially in Central Florida. In Hawaii, where Puerto Rican farm laborers and Mexican ranchers have settled since the late 19th century, seven percent of the islands' people are either Hispanic or Hispanophone or both. The Cuban Revolution of 1959 created a community of Cuban exiles who opposed the Communist revolution, many of whom left for the United States. In 1963, the Ford Foundation established the first bilingual education program in the United States for the children of Cuban exiles in Miami-Dade County, Florida. The Immigration and Nationality Act of 1965 boosted immigration from Latin American countries, and in 1968, Congress passed the Bilingual Education Act. Most of these one million Cuban Americans settled in southern and central Florida, while other Cubans live in the Northeastern United States; most are fluent in Spanish. In the city of Miami today Spanish is the first language mostly due to Cuban immigration. Likewise, the Nicaraguan Revolution promoted a migration of Contras who were opposed to the socialist government in Nicaragua, to the United States in the late 1980s. [ citation needed] Most of these Nicaraguans migrated to Florida, California and Texas. 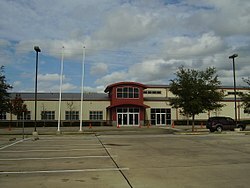 SER-Niños Charter School, a K–8 bilingual public school in Houston, Texas. Bilingual education is popular in school districts with large numbers of Spanish-speakers. The exodus of Salvadorans was a result of both economic and political problems. The largest immigration wave occurred as a result of the Salvadoran Civil War in the 1980s, in which 20 to 30 percent of El Salvador's population emigrated. About 50 percent, or up to 500,000 of those who escaped, headed to the United States, which was already home to over 10,000 Salvadorans, making Salvadoran Americans the fourth-largest Hispanic and Latino American group, after the Mexican-American majority, stateside Puerto Ricans, and Cubans. As civil wars engulfed several Central American countries in the 1980s, hundreds of thousands of Salvadorans fled their country and came to the United States. Between 1980 and 1990, the Salvadoran immigrant population in the United States increased nearly fivefold from 94,000 to 465,000. The number of Salvadoran immigrants in the United States continued to grow in the 1990s and 2000s as a result of family reunification and new arrivals fleeing a series of natural disasters that hit El Salvador, including earthquakes and hurricanes. By 2008, there were about 1.1 million Salvadoran immigrants in the United States. Refugees from Spain also migrated to the U.S. due to the Spanish Civil War (1936 - 1939) and political instability under the regime of Francisco Franco that lasted until 1975. The majority of Spaniards settled in Florida, Texas, California, New Jersey, New York City, Chicago, and Puerto Rico. 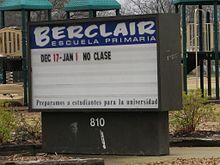 Public elementary school sign in Spanish in Memphis, Tennessee. Although the United States has no de jure official language, English is the dominant language of business, education, government, religion, media, culture, civil society, and the public sphere. Virtually all state and federal government agencies and large corporations use English as their internal working language, especially at the management level. Some states, such as Arizona, California, Florida, New Mexico & Texas provide bilingual legislated notices and official documents, in Spanish and English, and other commonly used languages. English is the home language of most Americans, including a growing proportion of Hispanic Americans; between 2000 and 2015, the proportion of Hispanics who spoke Spanish at home decreased from 78 to 73 percent. As noted above, the only major exception is the U.S. Commonwealth of Puerto Rico, where Spanish is the official and most commonly used language. All laws, decrees, regulations, and provisions emanating from any of the three supreme powers of this State, which from their nature require publication, shall be published in English and Spanish. —  California Constitution, 1849, Art. 11 Sec. 21. A person unable to understand English who is charged with a crime has a right to an interpreter throughout the proceedings. The state (like its southwestern neighbors) has had close linguistic and cultural ties with Mexico. The state outside the Gadsden Purchase of 1853 was part of the New Mexico Territory until 1863, when the western half was made into the Arizona Territory. The area of the former Gadsden Purchase contained a majority of Spanish-speakers until the 1940s, although the Tucson area had a higher ratio of anglophones (including Mexican Americans who were fluent in English); the continuous arrival of Mexican settlers increases the number of Spanish-speakers. 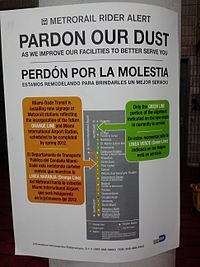 The majority of the residents of the Miami metropolitan area speak Spanish at home, and the influence of Spanish can even be seen in many features of the local dialect of English. Miami is considered the "capital of Latin America" for its many bilingual corporations, banks, and media outlets that cater to international business. Spanish has been spoken in the state of Kansas since at least the early 1900s, due primarily to several waves of immigration from Mexico. This began with refugees fleeing the Mexican revolution (c. 1910-1920). There are now several towns in Kansas with significant Spanish-speaking populations: Liberal, Garden City, and Dodge City all have Latino populations over 40%. Recently, linguists working with the Kansas Speaks Project have shown how high numbers of Spanish-speaking residents have influenced the dialect of English spoken in areas like Liberal, and other parts of southwest Kansas. There are many Spanish-language radio stations throughout Kansas, like KYYS in the Kansas City, KS area, as well as various Spanish-language newspapers and television stations throughout the state. Several towns in Kansas boast Spanish/English dual language immersion schools, where students are instructed in both languages for varying amounts of time. Examples include Horace Mann Elementary in Wichita - named after the famous educational reformer - and Buffalo Jones Elementary in Garden City, KS - named after Charles "Buffalo" Jones, a frontiersman, bison preservationist, and co-founder of Garden City. The Commonwealth of Puerto Rico recognizes Spanish and English as official languages; Spanish is the dominant first language. 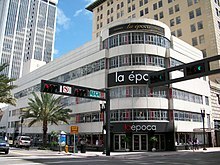 La Época is an upscale Miami department store, whose Spanish name comes from Cuba. La Época is an example of the many businesses started and owned by Spanish-speakers in the United States. The influence of English on American Spanish is very important. In many Latino  (also called Hispanic) youth subcultures, it is common to mix Spanish and English, thereby producing Spanglish. Spanglish is the name for the admixture of English words and phrases to Spanish for effective communication. Mexican Spanish: the U.S.–Mexico border, throughout the US southwest from California to Texas, as well as the city of Chicago, but becoming ubiquitous throughout the continental United States as Mexican Spanish is used as the standardized dialect of Spanish in the continental United States. Caribbean Spanish: Spanish as spoken by Puerto Ricans, Cubans, and Dominicans. Largely heard throughout the Northeastern United States and Florida, especially New York City and Miami, among other cities in the Eastern US. Central American Spanish: Spanish as spoken by Hispanics with origins in Central American countries such as El Salvador, Guatemala, Honduras, Nicaragua, Costa Rica, and Panama. Largely heard in major cities throughout California and Texas, as well as Washington DC, New York, and Miami. South American Spanish: Spanish as spoken by Hispanics with origins in South American countries such as Venezuela, Colombia, Peru, and Chile. Largely heard in major cities throughout New York, California, Texas, and Florida. Colonial Spanish: Spanish as spoken by descendants of Spanish colonists and early Mexicans before United States expansion and annexion of the US southwest and other areas. Most post-first generations of Spanish-speakers tend to speak the language with American English accents of the region they grew up in. Analogously, many Spanish words are now standard American English. First settled by the Spanish in the 16th century, today, 19% of Floridians speak Spanish, and is the most widely taught second language. In Miami, 67% of residents spoke Spanish as their first language in 2000. As most ancestors of Hispanic Americans came from Hispanic America, ⟨z⟩ and ⟨c⟩ (before / e/ and / i/) are pronounced as [ s], the same as ⟨s⟩. However, seseo (not distinguishing /s/ from /θ/) is also typical of the speech of Hispanic Americans of Andalusian and Canarian descent. Andalusia's and the Canary Island's predominant position in the conquest and subsequent immigration to Hispanic America from Spain is thought to be the reason for the absence of this distinction in most Hispanic American dialects. Standard Spanish from Spain, particularly the regions that have a distinctive / θ/ phoneme, realize / s/ with the tip of tongue against the alveolar ridge. Phonetically this is an "apico-alveolar" "grave" sibilant [ s̺], with a weak "hushing" sound reminiscent of retroflex fricatives. To a Hispanic and Latino American speaker (as well as to Andalusians or Canary Islanders in Spain), Standard European Spanish / s/ may sound close to [ ʃ] like English sh as in she. However, this apico-alveolar realization of / s/ is not uncommon in some Latin American Spanish dialects which lack [ θ]; some inland Colombian Spanish (particularly Antioquia) and Andean regions of Peru and Bolivia also have an apico-alveolar / s/. Spanish in the United States usually features yeísmo: there is no distinction between ⟨ll⟩ and ⟨y⟩, and both are [ ʝ]. However, yeísmo is an expanding and now dominant feature of European Spanish, particularly in urban speech (Madrid, Toledo) and especially in Andalusia and Canary Islands, though in rural use [ ʎ] is preserved in parts of rural northern Spain. Speakers of Rioplatense Spanish pronounce both ⟨ll⟩ and ⟨y⟩ as [ ʒ] or [ ʃ]. The traditional pronunciation of the digraph ⟨ll⟩ as [ ʎ] is preserved in some dialects along the Andes range, especially in inland Peru and the Colombia highlands (Santander), northern Argentina, all Bolivia and Paraguay. Most speakers with ancestors born in coastal regions may debuccalize or aspirate syllable-final / s/ to [ h], or drop it entirely, so that está [esˈta] ("s/he is") sounds like [ehˈta] or [eˈta], as in southern Spain ( Andalusia, Murcia, Castile–La Mancha (except North-East), Canary Islands, Ceuta and Melilla). ⟨g⟩ (before / e/ or / i/) and ⟨j⟩ are usually aspirated to [ h] in Caribbean and other coastal dialects, as well as in all Colombia, and southern Mexico, as in most southern Spanish dialects. While it may be [ x] in other dialects of Hispanic Americans and often [ χ] in Peruvian Spanish dialect, this is a common feature of Castilian Spanish. It is usually aspirated to [ h] as in most southwestern Spanish varieties. Very often, especially in Argentina and Chile, [ x] becomes more fronted [ ç] when preceding high vowels /e, i/ (these speakers approach [ x] to the realization of German ⟨ch⟩ in ich); in other phonological environments it is pronounced either [ x] or [ h]. In many Caribbean dialects, the phonemes / l/ and / r/ at the end of a syllable sound alike or can be exchanged: caldo > ca[r]do, cardo > ca[l]do; / r/ in word-final position becomes silent, giving Caribbean dialects of Spanish a partial non-rhoticity. This happens at a reduced level in Ecuador and Chile[ citation needed] as well and is a feature brought from Extremadura and westernmost Andalusia. In many Andean regions, the alveolar trill of rata and carro is realized as an alveolar approximant [ ɹ] or even as a voiced apico-alveolar [ z]. The alveolar approximant realization is particularly associated with an indigenous substrate and it is quite common in Andean regions, especially in inland Ecuador, Peru, most of Bolivia and in parts of northern Argentina and Paraguay. a tap, approximant, or [ l] when the followed by a vowel-initial word, as in amo[ɾ ~ ɹ ~ l] eterno 'eternal love'). The voiced consonants / b/, / d/, and / ɡ/ are pronounced as plosives after and sometimes before any consonant in most Colombian Spanish dialects (rather than the fricative or approximant that is characteristic of most other dialects): pardo [ˈpaɾdo], barba [ˈbaɾba], algo [ˈalɡo], peligro [peˈliɡɾo], desde [ˈdezde/ˈdeɦde]—rather than the [ˈpaɾðo], [ˈbaɾβa], [ˈalɣo], [peˈliɣɾo], [ˈdezðe/ˈdeɦðe] of Spain and the rest of Spanish America. A notable exception is the Department of Nariño and most Costeño speech (Atlantic coastal dialects) which feature the soft, fricative realizations common to all other Hispanic American and European dialects. Word-final / n/ is frequently velar [ ŋ] in Latin American Spanish; this means a word like pan (bread) is often articulated ['paŋ]. To an English-speaker, those speakers that have a velar nasal for word-final / n/ make pan sound like pang. Velarization of word-final / n/ is so widespread in the Americas that it is easier to mention those regions that maintain an alveolar, European-style, / n/: most of Mexico, Colombia (except for coastal dialects) and Argentina (except for some northern regions). Elsewhere, velarization is common, though alveolar word-final / n/ can appear among some educated speakers, especially in the media or in singing. Velar word-final / n/ is also frequent in Spain, especially in southern Spanish dialects (Andalusia and the Canary Islands) and also in the Northwest: Galicia, Asturias and León. Disappearance of de (of) in certain expressions, as is the case with the dialect of Spanish in the Canary Islands. Example: esposo Rosa instead of esposo de Rosa, gofio millo instead of gofio de millo, etc. Doublets of Arabic-Latinate synonyms with the Arabic form are more common in American Spanish, which derives from Latin American Spanish and so influenced by Andalusian Spanish like Andalusian and Latin American alcoba for standard habitación or dormitorio ('bedroom') or alhaja for standard joya ('jewel'). See List of words having different meanings in Spain and Hispanic America. Spanish-speaking Americans are the fastest growing linguistic group in the United States. Continual immigration and prevalent Spanish-language mass media (such as Univisión, Telemundo, and Azteca América) support the Spanish-speaking populations. Moreover, because of the North American Free Trade Agreement, it is common for many American manufacturers to use multilingual product labeling using English, French and Spanish, three of the four official languages of the Organization of American States. Besides the businesses that always have catered to Hispanophone immigrants, a small, but increasing, number of mainstream American retailers now advertise bilingually in Spanish-speaking areas and offer bilingual, English-Spanish customer services. One common indicator of such businesses is Se Habla Español which means "Spanish Is Spoken". 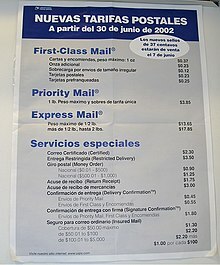 Federal agencies such as the United States Postal Service translate information into Spanish. The State of the Union Addresses and other presidential speeches are translated into Spanish, following the precedent set by the Bill Clinton administration. Moreover, non-Hispanic American origin politicians fluent in Spanish speak in Spanish to Hispanic majority constituencies. There are 500 Spanish newspapers, 152 magazines, and 205 publishers in the United States; magazine and local television advertising expenditures for the Hispanic market have increased substantially from 1999 to 2003, with growth of 58 percent and 43 percent, respectively. Historically, immigrants' languages tend to disappear or become reduced through generational assimilation. Spanish disappeared in several countries and U.S. territories during the 20th century, notably in the Philippines and in the Pacific Island countries of Guam, Micronesia, Palau, the Northern Marianas islands, and the Marshall Islands. The English-only movement seeks to establish English as the sole official language of the United States. Generally, they exert political public pressure upon Hispanophone immigrants to learn English and speak it publicly; as universities, business, and the professions use English, there is much social pressure to learn English for upward socio-economic mobility. Intergenerational transmission of Spanish is a more accurate indicator of Spanish's future in the United States than raw statistical numbers of Hispanophone immigrants. Although Hispanic American origin immigrants hold varying English proficiency levels, almost all second-generation Hispanic American origin U.S. residents speak English, yet about 50 percent speak Spanish at home. Two-thirds of third-generation Mexican Americans speak only English at home. Calvin Veltman undertook in 1988, for the National Center for Education Statistics and for the Hispanic Policy Development Project, the most complete study of English language adoption by Hispanophone immigrants. Veltman's language shift studies document abandonment of Spanish at rates of 40 percent for immigrants who arrived in the U.S. before the age of 14, and 70 percent for immigrants who arrived before the age of 10. The complete set of these studies' demographic projections postulates the near-complete assimilation of a given Hispanophone immigrant cohort within two generations. Although his study based itself upon a large 1976 sample from the Bureau of the Census (which has not been repeated), data from the 1990 Census tend to confirm the great Anglicization of the U.S. Hispanic American origin population. In 1610, Gaspar Pérez de Villagrá published his Historia de Nuevo México (History of New Mexico). In 1880, José Martí moved to New York City. Eusebio Chacón published El hijo de la tempestad in 1892. Federico García Lorca wrote his collection of poems, Poeta en Nueva York, and the two plays Así que pasen cinco años and El público while living in New York. Giannina Braschi wrote the Hispanic postmodern poetry classic El imperio de los sueños in Spanish in New York. José Vasconcelos and Juan Ramón Jiménez were both exiled to the United States. In her autobiography When I Was Puerto Rican (1993), Esmeralda Santiago recounts her childhood on the island during the 1950s and her family's subsequent move to New York City, when she was 13 years old. Originally written in English, the book is an example of New York Rican literature. Contemporary classics are The House on Mango Street by Sandra Cisneros, Crisis by Jorge Majfud, and The Brief Wondrous Life of Oscar Wao by Junot Diaz. ^ "US now has more Spanish speakers than Spain". theguardian.com. Retrieved 2016-05-09. ^ "2000 Census, Language in the US" (PDF). Retrieved June 5, 2007. ^ "Academia Norteamericana de la Lengua Española". Retrieved July 13, 2018. ^ "Primary language spoken at home by people aged 5 or older". United States Census Bureau. 2012. ^ US Census Bureau Public Information Office. "Facts for Features: Hispanic Heritage Month 2010: Sept. 15 — Oct. 15 - Facts for Features & Special Editions - Newsroom - U.S. Census Bureau". Archived from the original on 25 February 2015. Retrieved 5 March 2015. ^ a b c d Garcia, Ofelia (2015). "Racializing the Language Practices of U.S. Latinos: Impact on Their Education". In Cobas, Jose; Duany, Jorge; Feagin, Joe (eds.). How the United States Racializes Latinos. Routledge. pp. 102–105. ^ Van Young, Eric (2001). The Other Rebellion: Popular Violence, Ideology, and the Mexican Struggle. Stanford University Press. p. 324. ISBN 978-0-8047-4821-6. ^ a b Guadalupe Valdés et al., Developing Minority Language Resources: The Case of Spanish in California (Clevedon, UK: Multilingual Matters, 2006), 28–29. ^ Martin, Daniel W. (2006). Henke's California Law Guide (8th ed.). Newark: Matthew Bender & Co. pp. 45–46. ISBN 08205-7595-X. ^ Winchester, J. (1850). The Statutes of California Passed At The First Session of the Legislature. San Jose: California State Printer. p. 51. ^ a b Crawford, James (1997). "Puerto Rico and Official English". Language Policy. ^ , Leeman, Jennifer (2007) “The Value of Spanish: Shifting Ideologies in United States Language Teaching.” ADFL Bulletin 38 (1–2): 32–39. ^ a b Drew Walker (2010). "A Countries and Their Cultures: Venezuelan American". Countries and their cultures. Retrieved December 10, 2011. ^ del Valle, Jose (2006). "US Latinos, la hispanofonia, and the Language Ideologies of High Moderinty". In Mar-Molinero, Clare; Stewart, Miranda (eds.). Globalization and Language in the Spanish-Speaking World: Macro and Micro Perspectives. Palgrave Macmillan. pp. 33–34. ^ "What is the future of Spanish in the United States?". Pew Research Center. 5 September 2013. Retrieved 5 March 2015. ^ Language Use and English-Speaking Ability: 2000. Census.gov. ^ "The Future of Spanish in the United States". Retrieved 5 March 2015. ^ Data Access and Dissemination Systems (DADS). "American FactFinder - Results". Retrieved 5 March 2015. ^ "Primary language spoken at home by people aged 5 or older". United States Census Bureau. 2010. ^ Nasser, Haya El (January 2, 2015). "Candidates Facing More Latino Voters Who Don't Speak Spanish". Al Jazeera. ^ Enrollments in Languages Other Than English in United States Institutions of Higher Education[ permanent dead link], Fall 2009. ^ Cobos, Rubén, op. cit., pp. x-xi. ^ " Sec. 2054.001." Texas Legislature. Retrieved on June 27, 2010. ^ Oppenheimer, Robert (1985). "Acculturation or assimilation: Mexican immigrants in Kansas, 1900 to World War II". The Western Historical Quarterly. 16.4: 429–448. ^ "U.S. Census Bureau QuickFacts: Liberal, KS". U.S. Census Bureau. 2017. ^ "U.S. Census Bureau QuickFacts: Dodge City, KS". U.S. Census Bureau. 2018. ^ "U.S. Census Bureau QuickFacts: Garden City, KS". U.S. Census Bureau. 2018. ^ Alanis, Kaitlyn (June 13, 2018). "As the Latino population grows in this rural area, youths are developing a new accent". The Wichita Eagle. ^ "Hispanic Media Sources in Kansas". USDA National Resources Conservation Service. ^ Todd Chambers, "The state of Spanish-language radio." Journal of Radio Studies 13.1 (2006): 34-50. ^ Jorge Reina Schement, “The Origins of Spanish-Language Radio: The Case of San Antonio, Texas,” Journalism History 4:2 (1977): 56-61. ^ Félix F. Gutiérrez and Jorge Reina Schement, Spanish-Language Radio in the Southwestern United States (Austin: UT Center for Mexican American Studies, 1979). ^ Andrew Paxman, "The Rise of US Spanish-Language Radio From 'Dead Airtime' to Consolidated Ownership (1920s-1970s)." Journalism History 44.3 (2018). ^ Dolores Inés Casillas, Sounds of belonging: US Spanish-language radio and public advocacy (NYU Press, 2014). ^ Jordan, Miriam (April 4, 2012). "'Hispanics' Like Clout, Not the Label". The Wall Street Journal. ^ D.M. Levine (2012-01-19). "As Hispanic Television Market Grows, Univision Reshuffles Executives". Adweek. Retrieved 2013-10-02. ^ Smead, Robert; Clegg, J Halvor. "English Calques in Chicano Spanish". In Roca, Ana; Jensen, John (eds.). Spanish in Contact: Issues in Bilingualism. p. 127. ^ Roque Mateos, Ricardo (2017). A Good Spanish Book. University Academic Editions. p. 37. ^ Faries, David (2015). A Brief History of the Spanish Language. University of Chicago Press. p. 198. Escobar, Anna Maria, and Kim Potowski. 2015. El Español de los Estados Unidos. Cambridge University Press. Fuller, Janet M. 2013. Spanish Speakers in the USA. Multilingual Matters. Lipski, John M. 2008. Varieties of Spanish in the United States. Georgetown University Press.